To infinity and beyond goes “Interstellar,” an exhilarating slalom through the wormholes of Christopher Nolan’s vast imagination that is at once a science-geek fever dream and a formidable consideration of what makes us human. As visually and conceptually audacious as anything Nolan has yet done, the director’s ninth feature also proves more emotionally accessible than his coolly cerebral thrillers and Batman movies, touching on such eternal themes as the sacrifices parents make for their children (and vice versa) and the world we will leave for the next generation to inherit. An enormous undertaking that, like all the director’s best work, manages to feel handcrafted and intensely personal, “Interstellar” reaffirms Nolan as the premier big-canvas storyteller of his generation, more than earning its place alongside “The Wizard of Oz,” “2001,” “Close Encounters of the Third Kind” and “Gravity” in the canon of Hollywood’s visionary sci-fi head trips. Global box office returns should prove suitably rocket-powered. We begin somewhere in the American farm belt, which Nolan evokes for its full mythic grandeur — blazing sunlight, towering corn stalks, whirring combines. But it soon becomes clear that this would-be field of dreams is something closer to a nightmare. The date is an unspecified point in the near future, close enough to look and feel like tomorrow, yet far enough for a number of radical changes to have taken hold in society. A decade on from a period of widespread famine, the world’s armies have been disbanded and the cutting-edge technocracies of the early 21st century have regressed into more utilitarian, farm-based economies. And oh, what dirt! As “Interstellar” opens, the world — or at least Cooper’s Steinbeckian corner of it — sits on the cusp of a second Dust Bowl, ravaged by an epidemic of crop blight, a silt-like haze hanging permanently in the air. (Some of this scene-setting is accomplished via pseudo-documentary interviews with the elderly residents of some more distant future reflecting on their hardscrabble childhoods, which Nolan films like the “witness” segments from Warren Beatty’s “Reds.”) And as the crops die, so the Earth’s atmosphere becomes richer in nitrogen and poorer in oxygen, until the time when global starvation will give way to global asphyxiation. Many years earlier, Brand informs, a mysterious space-time rift (or wormhole) appeared in the vicinity of Saturn, seemingly placed there, like the monoliths of “2001,” by some higher intelligence. On the other side: another galaxy containing a dozen planets that might be fit for human habitation. In the wake of the food wars, a team of intrepid NASA scientists traveled there in search of solutions. Now, a decade later (in Earth years, that is), Brand has organized another mission to check up on the three planets that seem the most promising for human settlement. And to pilot the ship, he needs Cooper, an instinctive flight jockey in the Chuck Yeager mode, much as McConaughey’s laconic, effortlessly self-assured performance recalls Sam Shepard’s as Yeager in “The Right Stuff” (another obvious “Interstellar” touchstone). It gives nothing away, however, to say that Nolan maps his infinite celestial landscape as majestically as he did the continent-hopping earthbound ones of “The Prestige” and “Batman Begins,” or the multi-tiered memory maze of “Inception.” The imagery, modeled by Nolan and cinematographer Hoyte Van Hoytema on Imax documentaries like “Space Station” and “Hubble 3D,” suggests a boundless inky blackness punctuated by ravishing bursts of light, the tiny spaceship Endurance gleaming like a diamond against Saturn’s great, gaseous rings, then ricocheting like a pinball through the wormhole’s shimmering plasmic vortex. This leads to an extraordinary mid-film emotional climax in which Cooper and Brand return from one such expedition to discover that 23 earth years have passed in the blink of an eye, represented by two decades’ worth of stockpiled video messages from loved ones, including the now-adult Tom (a bearded, brooding Casey Affleck) and Murphy (Jessica Chastain in dogged, persistent “Zero Dark Thirty” mode). It’s a scene Nolan stages mostly in closeup on McConaughey, and the actor plays it beautifully, his face a quicksilver mask of joy, regret and unbearable grief. That moment signals a shift in “Interstellar” itself from the relatively euphoric, adventurous tone of the first half toward darker, more ambiguous terrain — the human shadow areas, if you will, that are as difficult to fully glimpse as the inside of a black hole. Nolan, who has always excelled at the slow reveal, catches even the attentive viewer off guard more than once here, but never in a way that feels cheap or compromises the complex motivations of the characters. On the one hand, the movie marvels at the brave men and women throughout history who have dedicated themselves, often at great peril, to the greater good of mankind. On the other, because Nolan is a psychological realist, he’s acutely aware of the toil such lives may take on those who choose to lead them, and that even “the best of us” (as one character is repeatedly described) might not be immune from cowardice and moral compromise. Some people lie to themselves and to their closest confidants in “Interstellar,” and Nolan understands that everyone has his reasons. Others compensate by making the most selfless of sacrifices. Perhaps the only thing trickier than quantum physics, the movie argues, is the nature of human emotion. Nolan stages one thrilling setpiece after another, including several hairsbreadth escapes and a dazzling space-docking sequence in which the entire theater seems to become one large centrifuge; the nearly three-hour running time passes unnoticed. Even more thrilling is the movie’s ultimate vision of a universe in which the face of extraterrestrial life bears a surprisingly familiar countenance. “Do not go gentle into that good night/Rage, rage against the dying of the light,” harks the good Professor Brand at the start of the Endurance’s journey, quoting the melancholic Welshman Dylan Thomas. And yet “Interstellar” is finally a film suffused with light and boundless possibilities — those of the universe itself, of the wonder in a child’s twinkling eyes, and of movies to translate all that into spectacular picture shows like this one. It’s hardly surprising that “Interstellar” reps the very best big-budget Hollywood craftsmanship at every level, from veteran Nolan collaborators like production designer Nathan Crowley (who built the film’s lyrical vision of the big-sky American heartland on location in Alberta) and sound designer/editor Richard King, who makes wonderfully dissonant contrasts between the movie’s interior spaces and the airless silence of space itself. Vfx supervisor Paul Franklin (an Oscar winner for his work on “Inception”) again brings a vivid tactility to all of the film’s effects, especially the robotic TARS, who seamlessly inhabits the same physical spaces as the human actors. Hans Zimmer contributes one of his most richly imagined and inventive scores, which ranges from a gentle electronic keyboard melody to brassy, Strauss-ian crescendos. 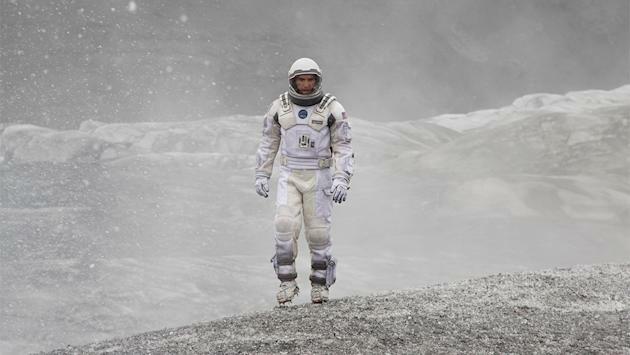 Shot and post-produced by Nolan entirely on celluloid (in a mix of 35mm and 70mm stocks), “Interstellar” begs to be seen on the large-format Imax screen, where its dense, inimitably filmic textures and multiple aspect ratios can be experienced to their fullest effect.